If you select more than one data source for your data flow, you must use a join object to connect them. You need to specify the common column or columns that will link the tables, as well as the type of join. You can perform an inner, left outer, right outer, full outer, or cross join. An inner join extracts those rows that appear in both tables. This is the default. A left outer join includes all of the rows from the table listed in the Left Source Columns grid, and the columns from the Right Source Columns grid that match one of these columns. A right outer join includes all of the rows from the table listed in the Right Source Columns grid, and the columns from the Left Source Columns grid that match one of these columns. A cross join is a Cartesian product of two tables. It consists of all possible pairs of rows from the two tables. A full outer join includes all of the rows that are extracted from both data sources. Note: You can create a recursive join by selecting the same data source twice. When you link data sources, DataMigrator identifies each table with Tn, where n is the order in which the table was chosen. For example, the first source chosen would be identified as T1, the second as T2, and so on. iWay lets you create joins across similar data sources, different data sources, and across servers (also known as cross-platform joins). In general, cross-platform joins, and joins without key fields, can create many intermediate files, depending on the number of tables joined. This issue may be less significant for some iWay platforms. For example, the Server for z/OS can use hyperspaces and alternate sort utilities. If performance is a concern, you should carefully evaluate the impact of your joins. Minimize the number of tables used in a join. 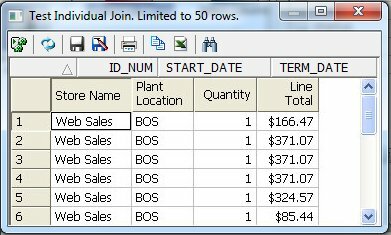 Join tables using key columns and indexes, when possible. Make sure that the smaller of the two tables is selected first, and the larger one is selected second. The default settings of the DMC automatically create join objects. If join objects are not being created, you can change your settings so that join objects are created automatically. Select Data Flow Designer from the General tree. Select the Add Join Object if needed check box in the On Add Source section. If the DMC is using the default settings, join objects are created automatically when you drag additional data sources into the data flow workspace. You can also add a join by right-clicking in the data flow workspace and selecting Add Join. In that case, you must connect the data source to the join by right-clicking it and dragging it to the join object. To complete the join, double-click the join object, or right-click a join object and select Join Editor. 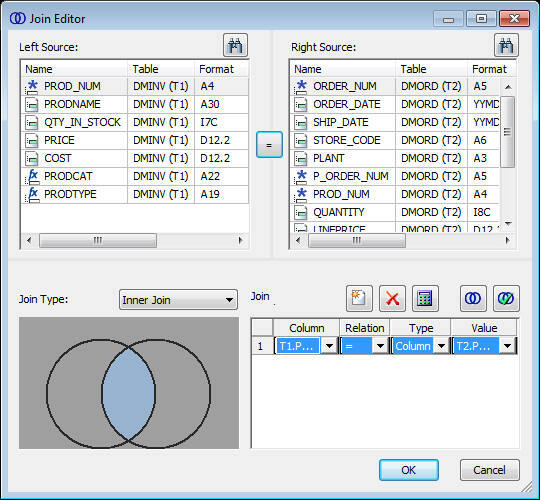 The Join Editor window opens, listing the columns from the two data sources in the Left and Right Source Columns lists. For more information, see Join Editor Window. If the two data sources have a column with the same name and format, and that column is a key column in one of the sources, an inner join will automatically be created for those columns. This default join can be changed, if necessary. If you want to join columns with different names, select one column from each list, and click the equal sign to create the join. The equality condition will appear in the Expression box under Join Conditions. DataMigrator supports both equi and non-equi (conditional) joins. In an equi-join, the condition is one of equality, while a non-equi join uses any other condition, such as greater than, less than, and so on. Note: You can delete the condition from the Expression box by selecting it and clicking the Delete Condition button. You can edit the condition by selecting it in the Expression box and clicking the Edit Condition button. Select the type of join you want from the Join Type drop-down menu, by clicking the join diagram, or right-clicking anywhere in the diagram and selecting a join type from the menu. Click the area where the circles intersect for an inner join. This is the default. Click the left circle for a left outer join. Click outside the circles for a cross join or Cartesian product. Click the right circle for a right outer join. Click an inner circle a second time for a full outer join. The type of join you create will be graphically displayed in the workspace. To add a calculation or SQL function to the condition, select it and click the Edit Condition button. When the Join Calculator opens, enter your calculation in the Conditions box by typing it, or by using the Columns/Variables and Functions tabs and the calculator buttons. For details, see Join Calculator. For information about using functions, see Using an SQL Function. For information about using variables, see Using Variables in a Flow. To define a new condition, click the Insert Condition button, which will launch the Join Calculator. This is where you can create the condition. Click the Test Join button to test the join. Click OK to save the join. Drag another synonym into the workspace, to the left of the SQL object. Double-click the second join object. Select one column from each list, and click the equal sign to create the join. An example of a data flow with three joined sources is shown in the following image. From the Join Editor window, click the Add new row button, and then click the Calculator button. Enter your calculation in the Expressions box by typing it, or by using the Columns/Variables and Functions tabs and the calculator buttons. For information about using functions, see Using an SQL Function. For information on using variables, see Using Variables in a Flow. From the Join Editor window, select the condition and click the Edit Condition button. Edit your calculation in the Expressions box by typing it, or by using the Columns/Variables and Functions tabs and the calculator buttons. To access the Join Editor window from the workspace, double-click a join object, or right-click a join object and select Join Editor. Displays the available columns from the first data source. Next to each column name, there is a symbol that indicates regular columns, key columns, index columns, or virtual columns. Displays the available columns from the second data source. Opens the Join Calculator to create a condition. Opens the Join Calculator to edit a condition. Opens the Join Analysis window, where the join condition is analyzed to show the number of rows and distinct rows that would result from a left outer, inner, and right outer join. Note: If you have not selected columns, test join displays the keys columns from the tables in the join. If you have selected columns, it displays the columns selected. If neither table has keys, and no columns were selected, test join displays an empty answer set. Lists the conditions by which the two data sources are connected. Enables you to select the join type from the drop-down menu or by clicking in the join diagram, which graphically represents the type of join being used. To access the Join Calculator from the Join Editor window, select a row and click the Edit Condition button. Displays available columns and variables. For alphanumeric data, this option specifies data will be returned if the field value is a substring of the right operand. Specifies that records with a null value for the specified column are returned. The following string returns the value TRUE if LAST_NAME is exactly five characters long and the first letter is S.
Returns if the value of the field is less than, or equal to the right operand. Specifies data if the field value equals the right operand. Is used in combination with the BETWEEN operator. Specifies data will be returned if the value of the field is greater than the right operand. Specifies data will be returned if the value of the field is greater than, or equal to the right operand. Specifies data will be returned if the left operand is not equal to the right operand. To access the Join Analysis window from the Join Editor window, click the Join Analysis button. 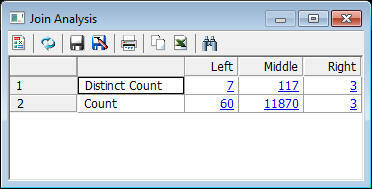 The Middle column shows the number of rows (Count) and unique rows (Distinct Count) that the entered join criteria would return for an Inner join. The Left and Right columns show the number of additional values and rows that would be returned for their respective join type. From the example shown in the above image, a Left outer join would return 60 additional rows with 7 unique values, in addition to the rows returned by the inner join. Note that all of the numbers in each row or column are also hotlinks. For example, if you double-click 7, a Test Results window opens, as shown in the image below. 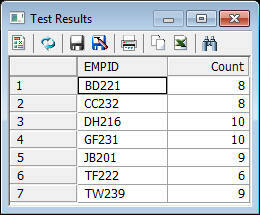 This window shows the 7 values for EMPID that were in the left source, but that were not found in the right source. Opens a window that allows you to view the join expression and sample data. Opens the Join Editor which allows you to create or edit the join conditions. Opens a submenu with the following options. Note that these options are only available when the Join object does not already have two inputs. Source. Opens the Select Synonym panel to add a new synonym to the data flow connected to this join object. When adding the second synonym the Select Synonym opens with Show synonyms with matching keys filter already enabled. Join. Adds a new Join object as input to this Join object. Select. Adds a new Select object as input to this object. Union. Adds a new Union object as input to this object. Deletes the selected Join object. Opens the properties panel for the selected Join object. Displays a dialog box with an error message. This option is only available if there is an error. For more information, click Details. To access the Test Individual Join window from the Join Editor window, select a join and click the Test Join button. Sample data from the join will be shown, as shown in the following image.